When it comes to your money, who wouldn’t want to save more, spend less and get the very best deal when it comes to banking, investing, retirement and financial services? MoneyRates is a personal finance wonderland, offering reviews, comparison tools, advice and more, with the goal of maximizing a user’s financial potential. The focus of MoneyRates.com is helping consumers make the most of their money by earning the highest possible rates on savings accounts, CDs, money market accounts, retirement accounts and basically any type of account that you can get from a financial institution. 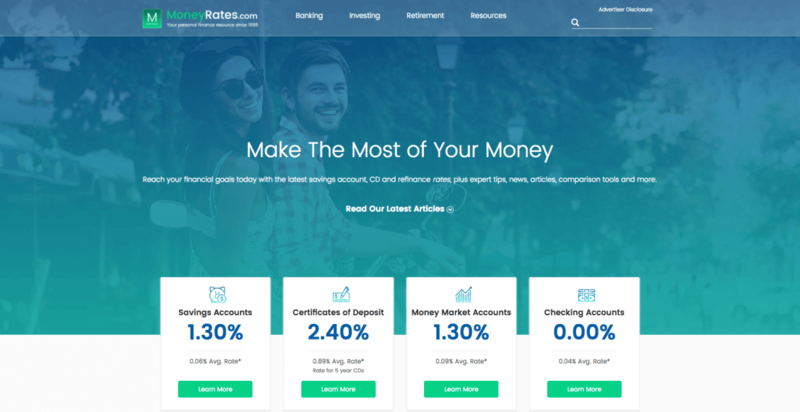 MoneyRates.com regularly monitors and collects information from more than 300 banks, allowing it to publish a comprehensive comparison tool, which shows how much interest customers can earn by parking their money in various accounts at a certain bank. “Big banks dominate the deposit market, yet tend to offer the lowest rates. We try to dramatize the differences by putting them in dollar terms rather than trying to get people excited about seemingly small percentage differences,” said Barrington, who says this tactic helps Americans become more aware of their banking choices. In addition, MoneyRates.com has published in-depth profiles of various banks, including well-known names like M&T Bank, USAA and Fifth Third Bank. If you visit the MoneyRates.com website, you’ll find products listed from a cross-section of banks, including Capital One, Barclays, Synchrony Bank, TD Bank and even smaller regional banks like Salem Five Direct and online-only banks like First Internet Bank. “Our team is always on the lookout for rates, but we make sure we continually supply a representative cross-section of the industry via the MoneyRates.com Index, which consists of the 50 largest retail deposit institutions that make their rates available, along with 25 medium-sized banks and 25 small banks,” said Barrington. With financial technology becoming an ever-important part of the banking equation, Barrington said consumers stand to benefit even more from a rate perspective. “Online banking has been a strong positive because by lowering costs it has allowed banks to offer higher rates. As banks and their customers increasingly adopt the type of goal-oriented tools that online banking makes possible, it could increase consumer awareness of what they need to do to save adequately,” he said. Besides a wealth of information on banks and interest rates, the site offers educational tools on retirement planning, investment strategies, compound interest calculators and much more.